In earlier times, manufacturers of automotive were using glass in headlights but over the time new invention found by the experts, they have replaced it with polycarbonate plastic in terms of manufacturing cost and other various reasons. Easier process of fixing and durability are other main reasons why they have leaning towards plastic headlight. ​After usage headlights for certain time of period, cloudiness occurs and factory clear coat sheds out completely. The only option is to use best headlight restoration kit to bring back that brightness and clarity. There are various other benefits of buying best headlight restoration kit. By using headlight restoration kit, you may probably save money as you do not have to pay for labor fees. Once your headlight sheds factory coating, it doesn’t provide sufficient visibility while you ride your vehicle and it is very dangerous for drivers as well as for pedestrians so it is highly advisable for restoration of your headlights. SYLVANIA is a global leader in advanced lighting and its accessories. 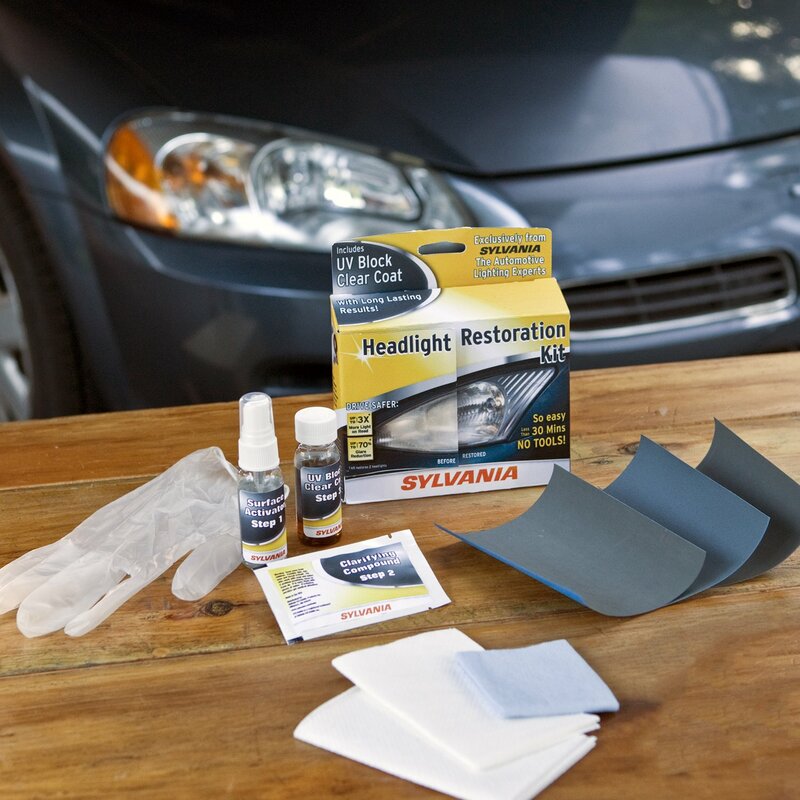 The SYLVANIA headlight restoration kit has everything that you require. It comes with gloves, polishing compound, masking tape, proper sandpaper, microfiber clothes, initial cleaning liquid and protective clear coat compound. 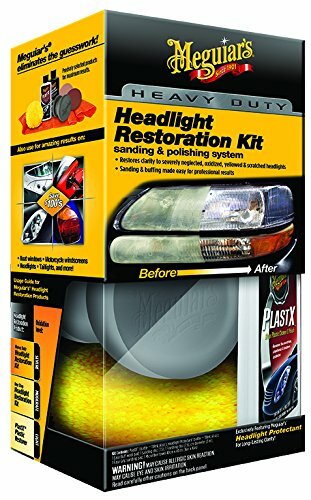 This restoration kit will provide extreme betterment in your headlight. 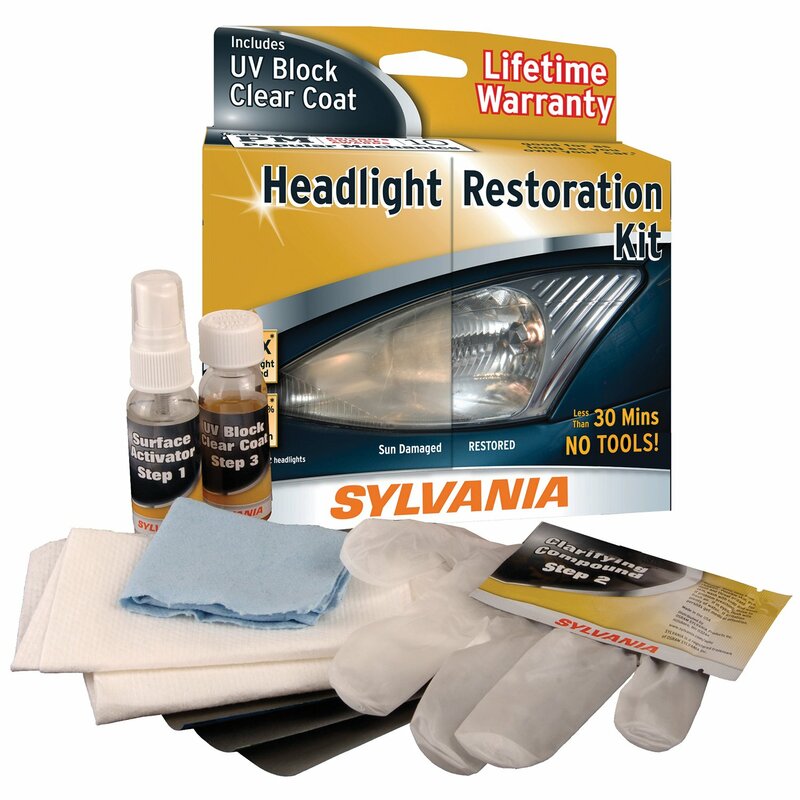 SYLVANIA restoration kit has advance technology that restore sun damaged and hazy lenses of headlights. It is also necessary to know about that clear coating begin to chip away after some days and they have given a tap with the package which can ruin your car pain layer when you try to pull off after the restoration. ​But still if you will look at its other features and benefits, it will surely attract you to buy this kit. It can fully remove corrosion and haze from headlight. Kit will also bring back beam pattern and light output. You will be surprised to see that it can reduce glare from your headlight. To prevent future deterioration, it will provide a UV barrier coating. This restoration kit will save your time as you do not require taking your vehicle to mechanic to restore headlight, it is so easy even you can do it yourself within 30 minutes in 3 easy steps and you do not require having any tools for the restoration process. 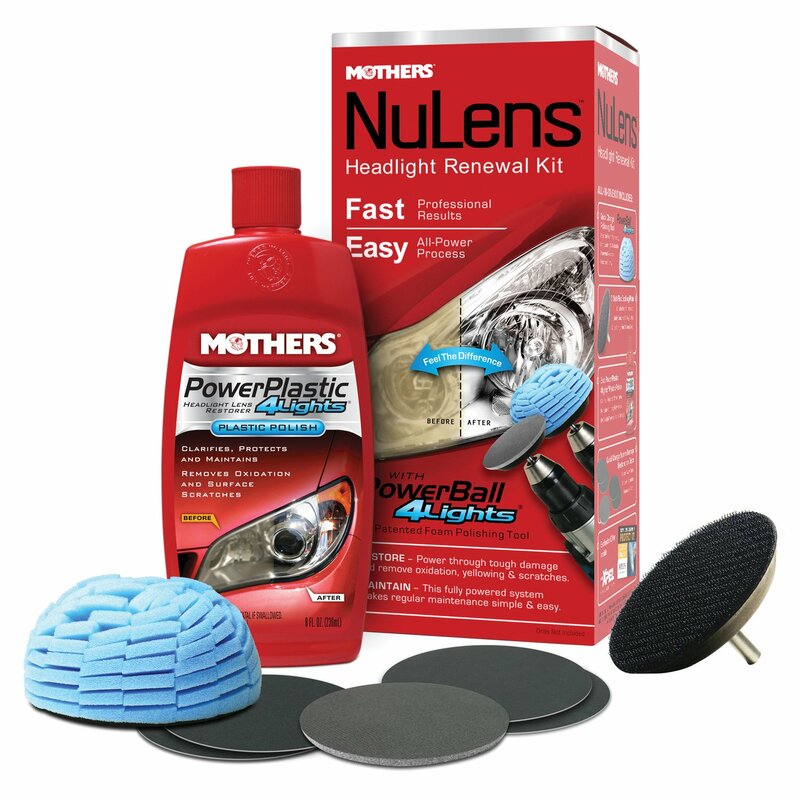 Mothers 07251 NuLens Renewal Kit gives power through oxidation on the headlights lenses and provide function and clarity. With its electric drill, it can polish hard plastic and headlight quickly. There is some drawback of this renewal kit which is very crucial to know before buying it. It has been noticed that the backing pad is not perfectly perpendicular to the stem so it rotated with a wobble and sometimes it is quite irritating to handle. Pad scratches some headlight model if it is not with flat surface. ​This headlight renewal kit is including 5 restoration pads that have 5 single sided sanding pads. These pads are enhancing the results if Powerplastic and Powercall did not achieve satisfactory outcome. One pad contains 800 grit coarse sands, another has 1500 grit sands and third one has 300 grit sands and so on. You will start cleaning and polishing process with the least aggressive pad which will be effective on the plastic of your headlight. After polishing with these pads if you still not get the satisfactory results, you may then use finer and finer pads and you will finally a scuffed smooth surface, after using these pads, you will use the Mothers PowerPlastic and Mother PowerBall 4 Lights for clarity and smoothness to the lens cover. When it comes to renewal your headlight lenses in most efficient and effective way, The Meguiar’s G3000 can be the real deal. It removes scratches, restores clarity and maintains visibility. This kit includes with all the necessary tools that require in polishing products, it also come with a microfiber towel. This kit is very easy to use and promise that it will work well even for heavy duty oxidation. This restoration kit comes with a complete package that one best restoration kit must have, package include two sanding disks, buffing wheel, finishing agent, a sanding handle to hold the disks, buffing compound and a microfiber towel. It doesn’t work well on some headlights models that has been noticed and moreover, after having cleaning process it may fade back to their unclear state. It also takes longer time in the process of cleaning. ​Still, if you will look at its other features and benefits this restoration kit can be your best choice. It comes with professional grade finishing discs with 1000 and 3000 grit sanding discs. Meguiar’s Easy Buff Wool Pad technology quickly removes oxidation from plastic headlights. PlastX helps to remove clouding from the headlights. If you will coat with Meguiar’s Headlight Protectant, it will act as a barrier between the plastic and harmful UV rays. Wipe new proudly provide the world’s longest lasting automotive products. They are very well known to launch their unique line with the high quality products since 2012 Wipe New’s original formula provided consumers with the first true solution to restoring old faded vehicle surfaces and protecting them for years. ​Wipe New HDL6CMTRRT is the most affordable, durable and easy to apply restoration kit. It reduces waste in a pre-saturated. It comes with ready to use package. You can also check other uses’ testimonials on their official website. 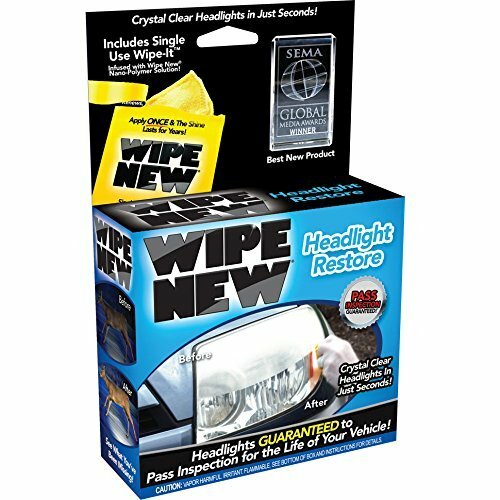 Wipe New claims that they have their own unique proprietary formula and application procedure that removes oxidation from your headlight lenses and protects them for many years so you do not require cleaning them again and again. You should also be aware that the size of sanding pad is too small and it may not be enough to clean one lens, you would have to buy new pad additionally. It has also been noticed that after using this kit, your vehicle’s headlight will start shining and but it doesn’t last long and would be faded after some days. 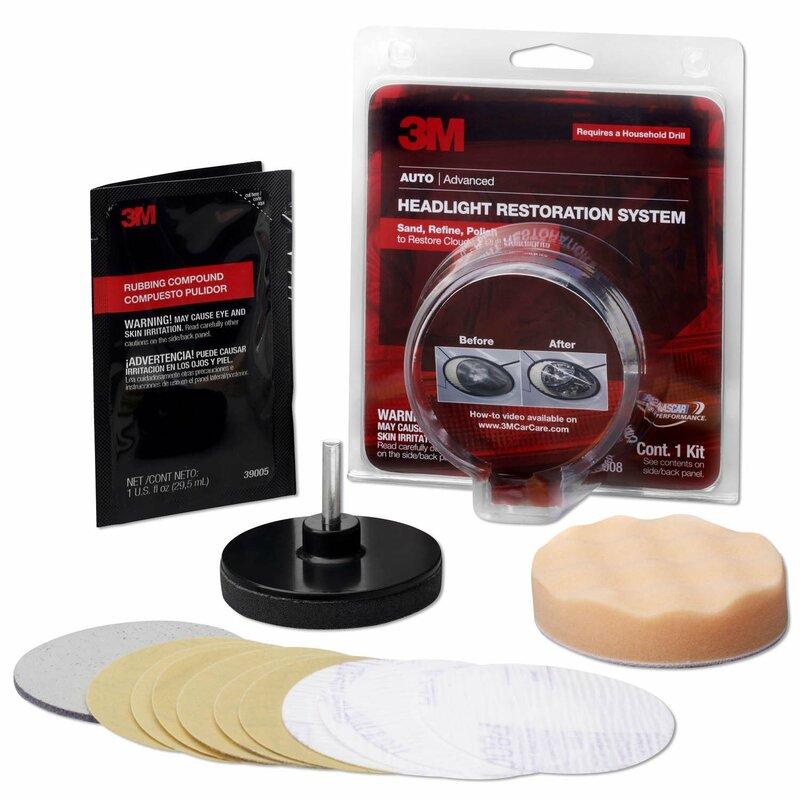 3M 39008 headlight lens restoration system is a collection of professional grade that specially designed to remove yellowed, cloudy that builds on headlight and makes it dead. By using this restoration system, you would probably save money and you do not need to spend extra dollars in replacing expensive headlights. ​3M has provided “How to” video on their official website so you can watch it and restore your vehicle’s headlights accordingly. It will help you how you can carry your restoration process thoroughly and accurately. So it is recommended by the manufacturer that you should read instruction fully before proceeding further. Along with its feature, you should also be aware that it has lack of more pads and you need to buy additional pads if require. Even after proper process, cloudy and scratches comes back. Moreover, it takes long time in entire process of restoration. ​Sealant doesn’t include with the package and you need to buy it separately. 3M restoration kit is very different from other headlight kits as in this kit it doesn’t require to sand by hand. It includes two-pack polishing compound and buffing pad that makes cleaning, sanding and polishing process quite effective and easy. This restoration system can work well on any types of oxidation as the way it sanding is quite unique. Another benefit of this car headlight is it’s very affordable as it comes with almost everything you require in process of restoration of your headlights. Above are the top 5 products of restoration kits which are the best according to us but if you are still not sure enough which is best headlight restoration kit that meets your need. Following are the essential points which you should take into the consideration before you go for any restoration kit from the market place. ​If you have gone through the internet, you would probably have found the numerous different types of restoration kits are available. Each has their own features, advantages and disadvantages. So you should first assess your requirement and you should also check when the last time you have rejuvenated your car headlight was? How heavy oxidation is on headlights? Have they become dull, yellow and scratched? Once you answer these questions, you would probably be sure which kind of restoration you need. There are so many various kinds of restoration which has their different oxidation capacity. Once you finalize the things, it will be easy for you to choose accordingly. ​Your next task is to check the quality of your restoration kit as there are so many poor quality kits are available in the market which can spoil your car headlight and you should also check the quality of the tap which they provide along with the package, if the quality of that tap is low, it may damage vehicles paint. ​In vehicle’s restoration process, it takes time as you have to do entire process thoroughly. Some restoration kits comes with the low price but it takes lot of time to complete entire process as you have to go through sanding, polishing and finishing while other kits comes with little high price tag but it doesn’t take much time to finish it. It can hardly take your 30 minutes of time and you will get the results. Once you start searching the best headlight restoration kit over the internet or to any other shop, you would probably be confused as there are numerous types of restoration kits are available in the market. So you should first shortlist the items which you have liked according to its quality, price, brand and other things. Once you have shortlisted all the items, it would be easy for you to pick the best headlight restoration kit that meets exactly your need. ​In today’s internet world, manufacturer always attract their customer by putting wrong description and benefits onto their website and other market place. So it is advisable to check the reviews of that particular restoration kit before buying it. You should also check manufacturers’ official website and check whether that product in genuine or not. You should check its detailed information. You may check user’s review under the product or you may also visit various sites to check the same. You may also join different groups in social media and discuss about that product. ​You would probably get the headlight restoration kit at any vehicle décor or vehicle maintenance shop, they would have various types of restoration kits with the different prices. You may buy from there according to your need but we will also advice to buy the same from the online web portals like Amazon.com where you will get it at best rate and you can also check other customers reviews regarding a particular restoration kit. Other, You can view that forum where the users have shared their reviews after using kits. With their different pros and cons, you will get idea where that product meets your need or not. We have short listed two best products of headlights among above all which are best according to us, Mothers 07251 NuLens Headlight Renewal Kit and 3M 39008 Headlight Lens Restoration System. Mothers 07251 NuLens Headlight Renewal Kit has all the features which you may be looking for, it can be your best choice in headlight restoration kit. It has PowerBall 4 lights ball which can enhance clarity to your headlight quickly. It includes 5 restoration pads with grit sands which you can use according to oxidation. Another restoration kit which we have selected is 3M 39008 Headlight Lens Restoration System. It also could be your best choice and there are so many features which makes this kit outstanding. Biggest benefit of this kit is you do not require sanding by hand. 3M has provided “How to” video on their official website so you can watch it and restore your vehicle’s headlights accordingly. 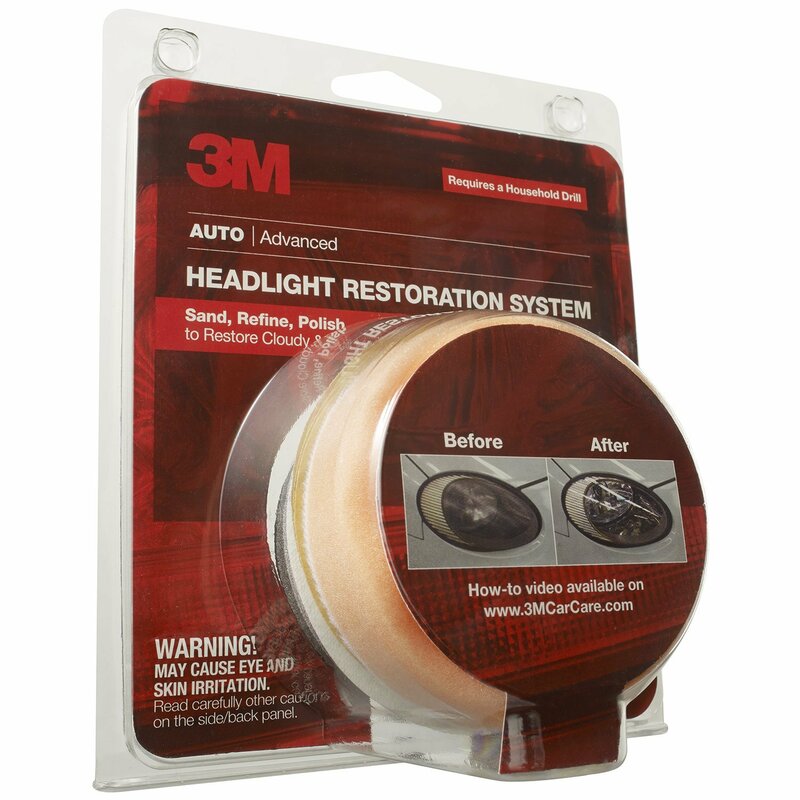 3M 39008 is intended to restore two headlight lenses so that you do not have to buy it additionally. Moreover, this kit is designed with 3M abrasive technology that restores your dull and hazy headlight lenses very easily and quickly. So this could be your best headlight restoration kit that meets your every need. ​All in all, you require little research over the internet in order to buy the best headlight restoration kit. However, this entire article must have given sufficient knowledge about the best headlight restoration kit.